Colored concrete is our #1 specialty! After applying hundreds of pounds of dry shake color over the years, our crews are expert at creating the look of variegated stone in concrete. 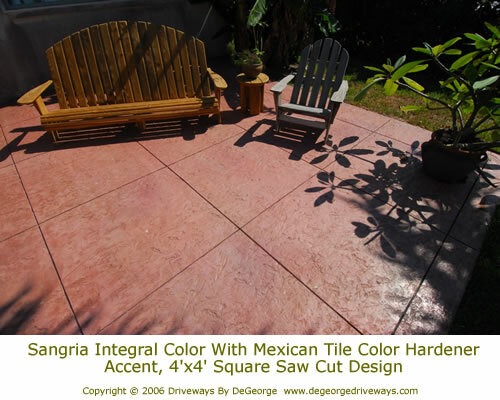 We also offer integrally colored concrete where color is added directly into the concrete as it is being batched. From this point we can add architectural surface textures to your driveway or for a clean look, broom finish and picture frame the edges. This look is routinely specified by architects and general contractors. Copyright 2009 Driveways By DeGeorge. All rights reserved.